School is almost out and that means that summer is just around the corner! 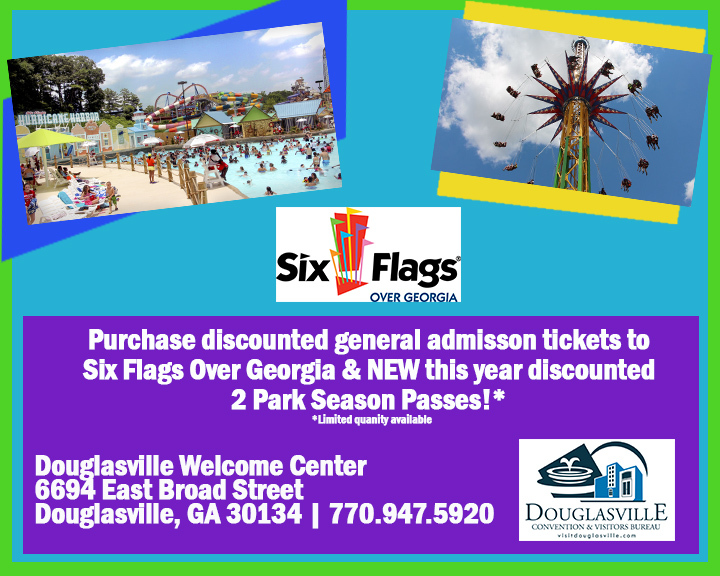 Before you head to Six Flags, be sure to stop by the Douglasville Welcome Center, where you can purchase discounted one day general admission tickets! New this year we also have discounted 2 park season passes to Six Flags Over Georgia and Six Flags White Water! (Quantities are limited.) Tickets can be purchased Monday – Friday 8:00AM – 5:00PM, by stopping in the Douglasville Welcome Center at 6694 East Broad Street, Douglasville, GA 30134. Tickets can only be purchased with cash or checks; credit or debit cards are not accepted. Call 770-947-5920 for more information. Connect with us and join the conversation! Connect with us on Facebook, Twitter, Instagram, Pinterest, & LinkedIn!